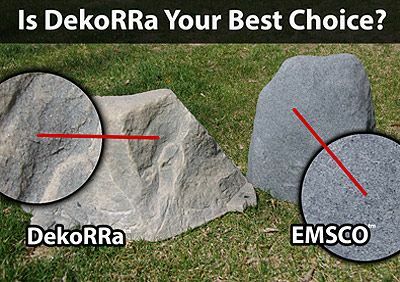 The DekoRRa Mock Rock Model 106 is a great small fake rock cover for a variety of applications. It’s the perfect size for hiding outdoor outlets, outdoor lighting transformers, vent pipes and more. R-13 Frost Protection For Wells & Backflow Valves. Fits Under Mock Rock. Added freeze protection. Requires 120v outlet. The Dekorra “RealRock” Model 106 is probably the cutest of the DekoRRa Mock Rock family. 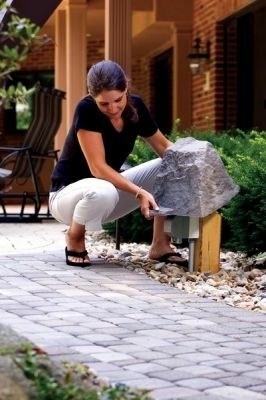 Smallish in size yet big on the functionality it’s always ready to pounce on a variety of objects: outdoor outlets, sprinkler heads, faucets, irrigation valves, and septic pipes are all fair game when the Model 106 mock rock is hunting for something to cover! 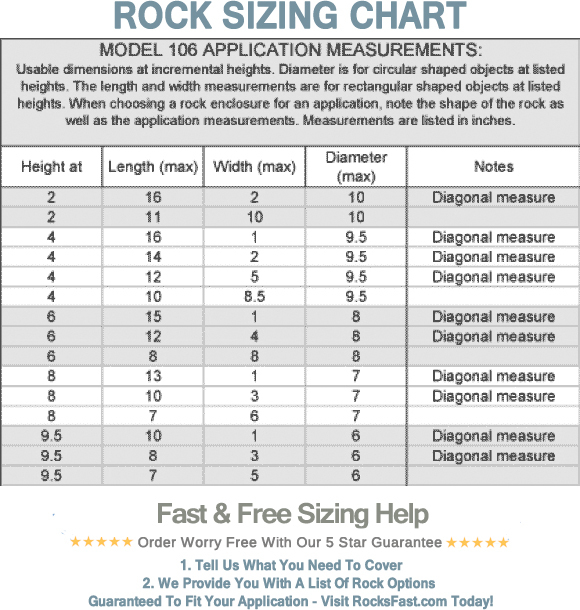 This is a great small fake rock for a wide variety of applications. IMPORTANT: Please see interior dimension charts below. 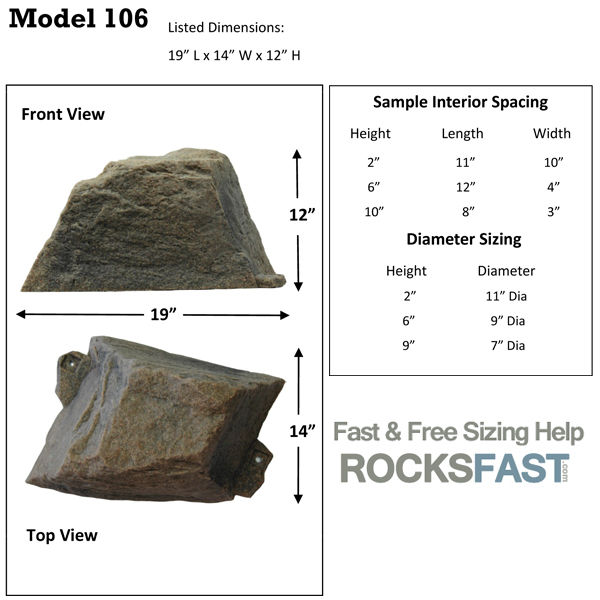 What the model 106 mock rock lacks in size it more than makes up for in realism and attention to detail. The colors and textures are incredibly lifelike and will blend into any natural environment. Over time as the rock weathers and becomes dusty, it starts to look even more realistic and convincing. The manufacturer uses a patented process which infuses ultraviolet inhibitors with the colorant and textures. The end product is an extremely realistic, and totally weatherproof design which will never fade in the sun or become brittle in brutally cold temperatures. 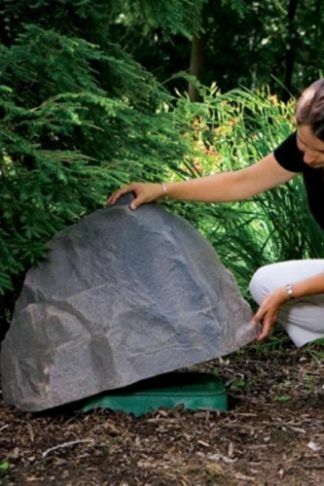 These fake rocks are built for the long run and provide years and years of totally maintenance free performance. If your desire is to hide an object on your property under a hollow rock that actually looks real, then look no further than this model 106. It’s gritty, tough, and super rugged. With a natural look that will fool anybody from near or far. 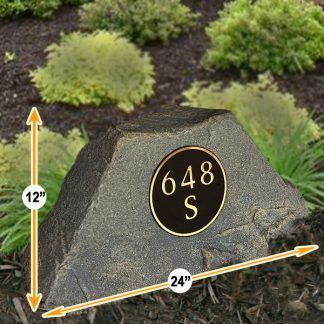 The included ground stakes securely fasten the rock edges to the ground. Hollow design hides unattractive utilities while adding character to your landscaping. Will fool friends and neighbors. Textures, colors, and UV protection are molded, not painted or sprayed. Will not fade from UV damage or become brittle in cold weather. Rugged design is string trimmer proof. Lightweight and easy to use. Just set it and forget it. Green design, made in the USA with 100% recycled resins. If you have the need for small fake rocks, then this model may certainly be the perfect fit for your application. Fast delivery. Easy installation using the supplied pegs.This rock survived the winter of 2013 with 39 " of snow piled on top. It’s so realistic looking, my neighbor thinks it’s a a real rock.